Matching a woman whose influence has been for decades and across genres, Aretha Franklin's eight-hour funeral on Friday included just about everything and everyone. 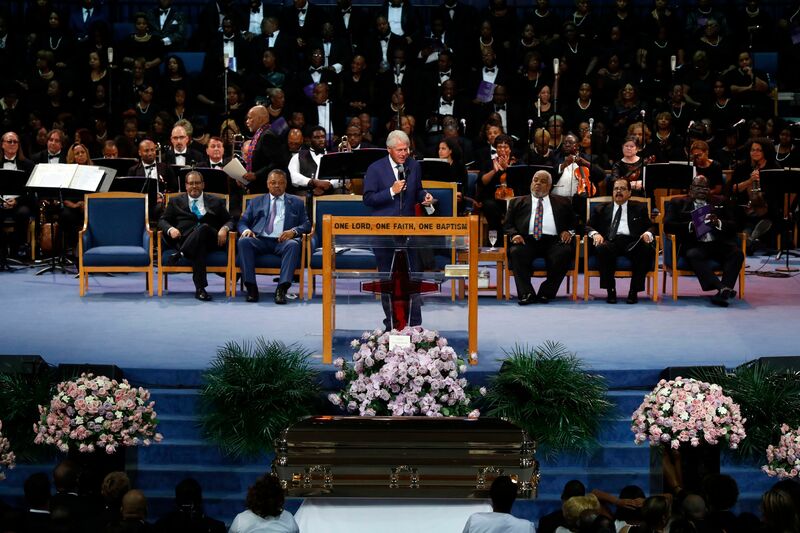 In the 4,000-seat Greater Grace Temple in Detroit, Franklin was praised by past presidents, entertainment titans and religious figures: Bill and Hillary Clinton, Reverend Jesse Jackson, Clive Davis and Franklin's grandchildren represented every aspect of their lives. 9th century. The tribute was sprawling, overwhelming and musically potent. Although the entire service was broadcast live, sometimes the view from the church was a bit different. Here are a few things you may not have noticed during the transfer. The Seven Mile Road, the wide boulevard on which the church stands, was lined with families sitting on pop-up or beach chairs to feed their own Waiting as limousines drove by. Two dueling Aretha T-shirt smugglers also got into a brawl on a 7 Mile Corner. But Franklin's influence, especially in the music world, was seen in the lobby, where massive floral arrangements by Barbra Streisand, The Jackson Family, Mariah Carey, The Four Tops, Tony Bennett and The Carters (yes, Jay-Z and Beyoncé) were exhibited. It's hard to imagine so many artists being greeted by so many colleagues. Considering Franklin's roots in the church, it was only natural that gospel was part of the program, but the crowd made it clear that these were the kinds of songs they longed for, almost as a possibility to channel their grief. Interestingly enough, many of the speeches referred to their version of "Respect," but the song was never performed by anyone. Judging by the Church's response to its introduction and recognition, Clinton maintains a strong bond with African Americans even after almost 20 years. His affection for Franklin came through as he talked about how he and Hillary were "Aretha Groupies" during their youth and the time he spent with Franklin backstage at their last public performance (Elton John's AIDS Foundation last year) November, where he was surprised that she sang) for 45 minutes despite growing health problems). Clinton took his toll by pulling out his phone and playing "Think" on the microphone. ("It's the key to freedom!" He beamed). The crowd ate everything up. One of the only eruptions in the church that grew louder was when writer and georgetown professor Michael Eric Dyson insulted the current president's comment on Franklin ("She worked for me"). With unconcealed indignation, Dyson, one of the fiercest tribute speakers, yelled, "She's not working for you, she's been working on you, she's been working on you, getting her preposition right!" The church practically shook in response. Many of the speakers, from Tyler Perry to the former Attorney General Eric Holder cited her favorite songs by Franklin ("Dr. Feelgood" for Perry, for example). Clive Davis, who rekindled Franklin's career in the 1980s, spoke of meeting her in 1979 to plan their comeback and proudly named all the hits they had to applause. But Franklin's role as a symbol of civil rights and empowerment came more than stories of the power of her voice. "She has never been ashamed, she has never put us in disgrace," said Reverend Al Sharpton, adding that although people disagree in many things, "we all agree on Aretha." She "left the world a better place than she found," said another minister. During his grim tribute, Jesse Jackson gently said, "If you leave here today and do not register, you will dishonor Aretha." (Jackson seemed most visibly struggling with the day, as he repeatedly closed himself over the Als coffin as Franklin's open coffin before the tribute began, he stepped to the stage and put his hands on the coffin to say goodbye for good Franklin's music was loved in the church, but her struggles, determination, and diligence made her one of the most humane pop stars. At 6:00 pm Wonder was nowhere to be seen, and the energy in the Greater Grace Temple diminished. Part of the audience was filtered out after eight even hours, and at the last minute Gladys Knight sang "You'll never walk alone" while the crowd waited. Then Wonder was announced and accompanied on stage. He looked serious and painful, dressed in black, his braids under a black cap. Pulling out a harmonica, Wonder began playing "the Lord's Prayer" instrumentally as the replacement musicians cautiously contributed to the tribute. Nobody seemed to know where he was going or when it would end. When the time came, Wonder talked a bit about Franklin: "Because black lives are important, because all lives are important, and if we love God, then we really know that it is our love that makes all things important Aretha has been telling her all her life. "